ChromaBlast is a unique patented ink and media combination driven by powerful print software to create the best cotton imaging system available. As heat and pressure is applied to the cotton, a chemical cross-link with cotton occurs. The result is a customized cotton shirt with soft hand, vibrant color and superior wash ability. 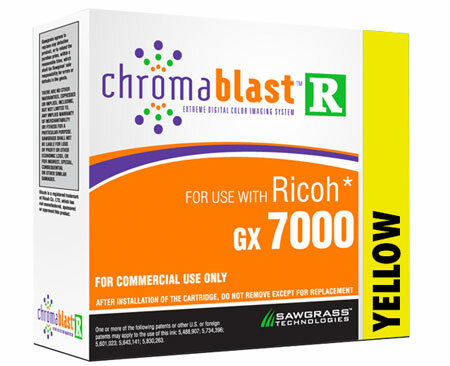 ChromaBlast Inks for Ricoh GX7000 printer. NOTE: When using Chromablast Ink you must install the corresponding Virtual Print Manager or Chromablast Driver depending what printer you have. RETURNS: Once ink has been removed from its packaging, it is NON-RETURNABLE. Please verify that you have purchased and received the correct ink for your printer before opening.